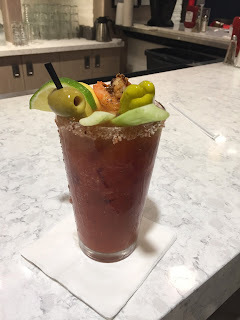 I know it seems a bit strange to be writing about Bloody Mary's, but I have seen some interesting interpretations of this breakfast drink during my trip to Las Vegas. Let me state right up front, I have NOT personally consumed any of these concoctions, but I have witnessed other members of my group enjoying these drinks. The first Bloody Mary of the trip was at the airport bar in Baltimore. It was made with everything and contained shrimp, an assortment of veggies, olives, and bacon. The salt around the top of the glass was a nice touch. Sadly, for the people who ordered this beverage, it was delivered only about 15 minutes before we boarded the flight to Las Vegas. The second Bloody Mary was even more over the top. It was created at the hotel for members of our group that we met up with in the check-in line. It was astounding and even more over the top than the ones a few hours earlier in Baltimore. It was definitely breakfast and while there was no shrimp, it appeared that a whole side of bacon was included in the glass. The final entry in the Bloody Mary competition was at TPC Las Vegas where we played a great round of golf. This was a more classic and, frankly, less appealing version that some of the others; but it was appropriate for drinking from a moving golf cart. The winner was the Bloody Mary at the hotel. I may never see one like that again!